Dr. Maya Angelou had an extraordinary wit and her literary style was passionate and profound in every sense ; some would say her style was irrefutable. She taught women to be bold and fearless, yet she taught them to maintain a classy and sophisticated demeanor. She taught men to be strong and to respect women. She taught men and women alike there is a whole world out there and encouraged us to explore it. She advocated for change and encouraged us to do the same. She taught us about spirituality and being thankful. She taught us to be proud of and to respect who we are. 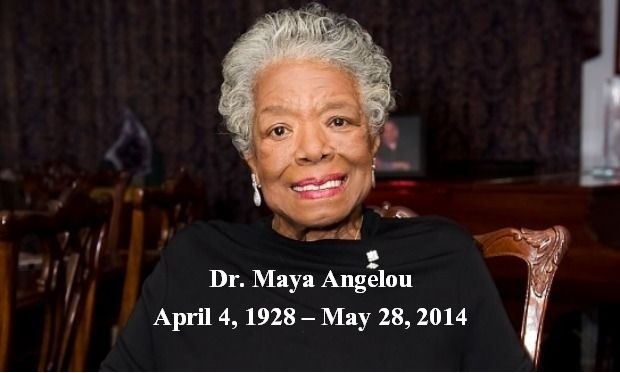 Dr. Maya Angelou your legacy is phenomenal and we thank you for the lessons you have bestowed upon us. May the ancestors welcome you with open arms and may your sweet soul rest in eternal peace. a kaleidoscope of the imaginable and unimaginable. one lowly character at a time. The art of writing truly is a labour of love! Silence at times is the most riveting; most eloquent; most profound form of communication. It has an uncanny ability to say what words cannot. It whispers like a gentle lullaby; and is oft like a fawn lost in the woods; weeping in despair. elevating you higher and higher. Our thoughts are mere whispers from the universe falling gently on our ears. Whispers that converse with our hearts and reasons with our soul. The voice of reason transcending us beyond the stars of the sky. The voice of ignorance which plummets us to the darkest corners of the earth. a dance, yes, a ballet. and the darkness of the steel-blue sky. Fixated and overwhelmed with emotions. As quickly as they appear, they are gone. With reverence, the curtains close. Another classical production comes to an end. Oh what a shame…. to such demise; having brilliant ideas fall on deaf ears & blind eyes.